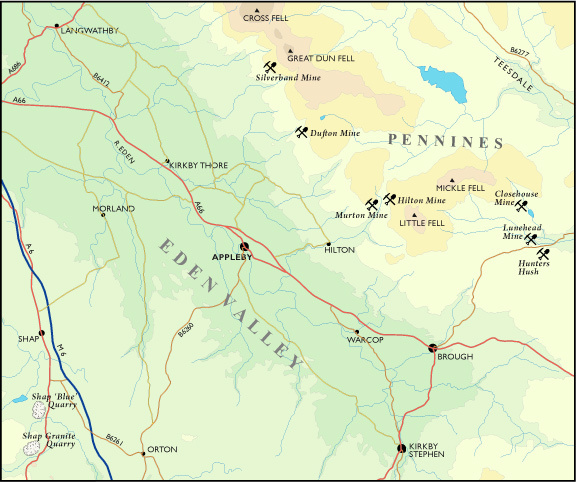 zone of the Pennine orefield, barytes is the dominant gangue mineral and although in earlier times the mines were worked on a small scale for lead a new lease of life was injected into them when barytes became a saleable product. 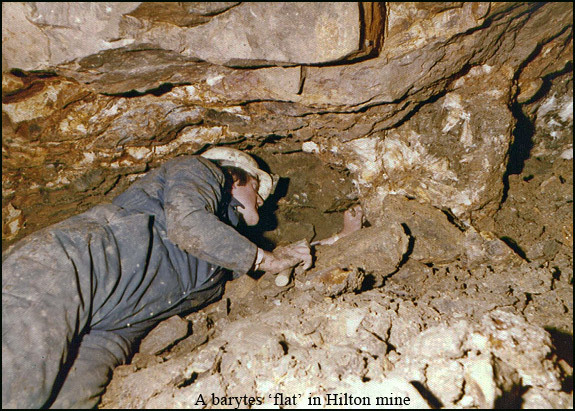 The occurance of fluorite at Hilton mine is unusual, the veins worked there forming part of a small fluorite outlier within the outer barite zone. the Shap ‘blue’ quarry, working rocks of the borrowdale volcanic series that have been highly altered by the heat of the nearby granite intrusion. The Howgill Fells above Kirkby Stephen form the Southern boundary. There are mines here too and whilst fluorite, galena and a little azurite have been found, specimens are only of locality interest. Situated in the higher part of Rundale Beck they were part of the London Lead Companies leases and were worked by that company for lead between 1821 and 1873. Barite production commenced in 1882 and continued until 1897. In more recent times Sanbar minerals worked the dumps in the 1980’s. 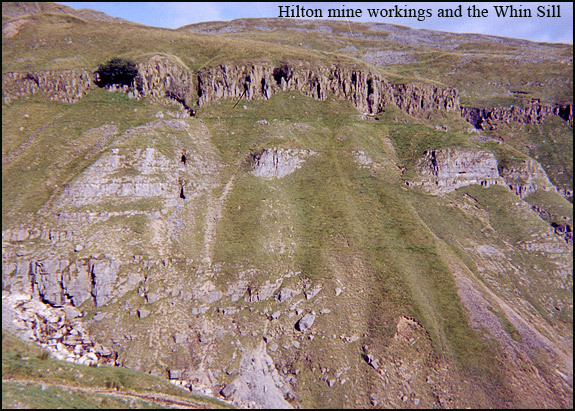 Of the two mines, Dufton was the more productive, working a number of veins where mineralisation was predominantly in the form of small flats containing galena, barite and aragonite, the later reported by Davison and Thompson as occurring as Flos-Ferri and of a fine fibrous type. They also report sphalerite and smithsonite although other references suggest there is no zinc mineralisation here. Mineralogically it is known for a reported single barite crystal weighing 50 kilos and occasionally smaller ones up to about 20cms do come on the market. Unlike other mines on the escarpment, barite crystals from Dufton often have complex multi-terminated crystals. most well developed and largest crystals forming twins whilst the surrounding smaller crystals show no sign of twinning. The quality of the specimens is a summation of, the frequency of twinned crystals; the internal clarity and absence of internal fractures; their mirror like surface lustre and their colour. Fluorite also occurred in association with barite, quartz and galena crystals. Pyrite inclusions within the fluorite are common. Other cavities within the flats contained sticky clay-filled vughs with large groups of clear and white platy barite crystals often up to 25cms across. At the back of the flats, fluorite dies out and cavities of nail-head calcite and barite pseudomorphs after witherite occur along with barite. Galena crystals were common although oxidised and not to the size of those from the nearby Weardale and Alston mines. Cerussite and anglesite crystals occur but are not common. Within the deads large balls of pyrite up to 25cm diameter and usually encased in calcite were occasionally found. An unusual pod of Nickel mineralisation was found in the 1980’s with annabergite, niccolite, gersdorffite and millerite. Wilson’s level below the flats was a source of white to grey chisel type barite crystal groups. The hillside further to the west is intriguingly called Amber Hills but the levels are fallen in. 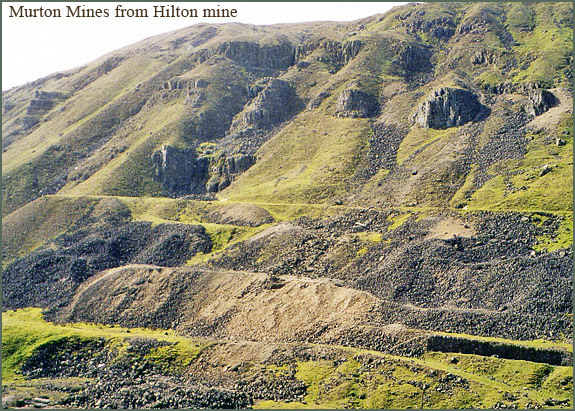 Hilton and Murton mines lie on MOD property and access to all the mines is no longer allowed. calcite, quartz and in places quite rich malachite and azurite staining. Witherite in brown semi-transparent nodules up to 15cm occur on the ridge above Mason’s Hole. bismuthinite, pyrite and molybdenite are not uncommon. Rare micro material found includes apatite, bastnasite group minerals, bavenite, bertrandite, chalcopyrite, cosalite, epidote, magnetite, milarite, scheelite, rutile, titanite and wulfenite. Epidote in opaque crystals to 2cms and garnets in opaque to semi-transparent red-brown crystals up to 7cms were relatively common here with crystallised quartz, calcite, pyrite and chalcopyrite. 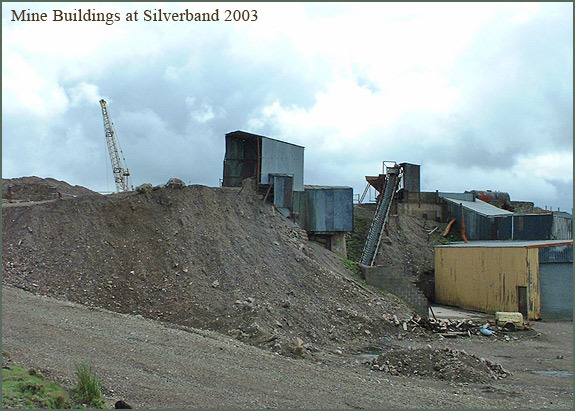 An old mine worked for lead in the seventeenth century and by the London Lead Co. from 1820 to 1879. 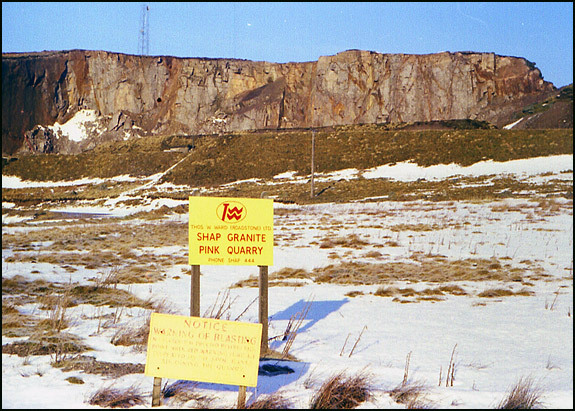 Subsequently it was worked underground by Laporte’s for barytes between 1939-1963 and later by opencast methods in the 1970’s and 1980’s. Laportes built two aerial ropeways to get the product to Long Marton station, evidenced by a line of derelict pylons that still survive. Veins and replacement ore bodies that occur here are mostly found in the Great Limestone. 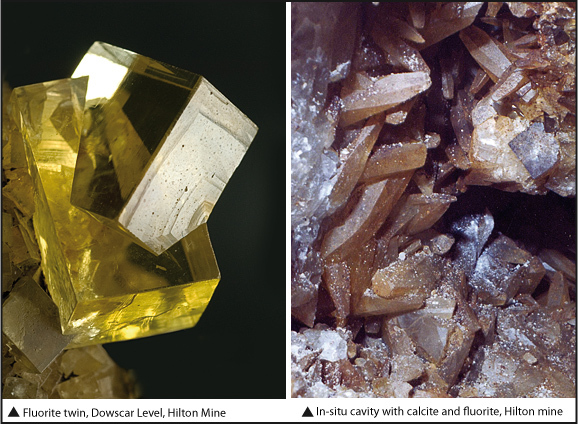 Large crystals of barite have been found here and some smaller examples were of sufficient clarity to be faceted. Both tabular and ‘chisel’ shaped crystal forms occur here. A find in 1952 produced complete transparent single crystals with unusual yellow/ brown colour zoning. Besides barite, the ore-bodies contained smaller amounts of aragonite, calcite, galena and sphalerite with witherite being reported by Bramall. Attractive bright pyrite crystal groups weather out of the shales above the Great Limestone. 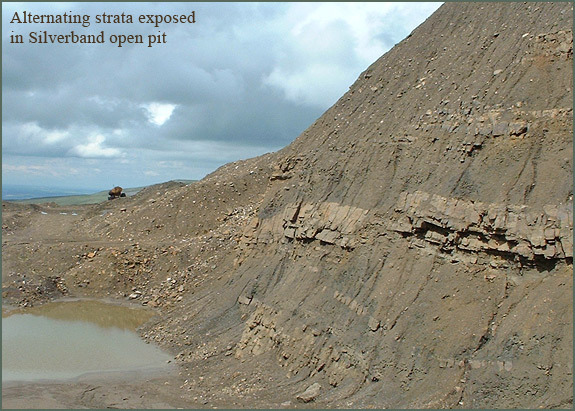 Opencast workings are known to pre-date the acquisition of the mine by the London Lead Co. in 1770. They worked the deposit for lead until relinquishing their lease in 1880, total production though is thought to be small. In 1939 the property was opened up again and work began mining and opencasting the large barite deposit. A number of owners have subsequently continued this work, it only closing as recently as 2000. 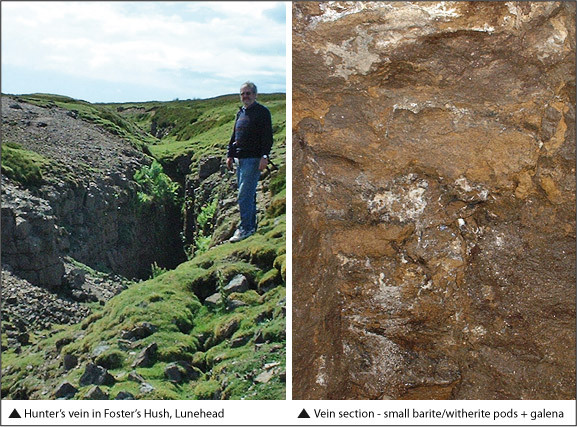 Old mine reports refer to galena and pyromorphite in the southern opencast at West hush. Although essentially a homogeneous massive barite deposit, barite crystals have been found with supergene lead minerals; cerussite, leadhillite, pyromorphite and anglesite crystals to 1cm. Calcite, blue-banded aragonite, malachite and rosasite are also reported. Worked for lead as Closehouse was between 1770 and 1880 by the London Lead Co., with barite production commencing in 1884. The main level driven south from Lune Beck cuts nine E.N.E. veins which carried oreshoots in the Great Limestone, which here has an exceptional thickness of 102ft. The main gangue mineral is barite with aragonite also reported and on Cavern vein the forehead of the level is reported to be in witherite. The Lunehead No. 1 vein continues N.E. as Hunter’s vein and exposed in Foster’s hush shows witherite and barytocalcite.